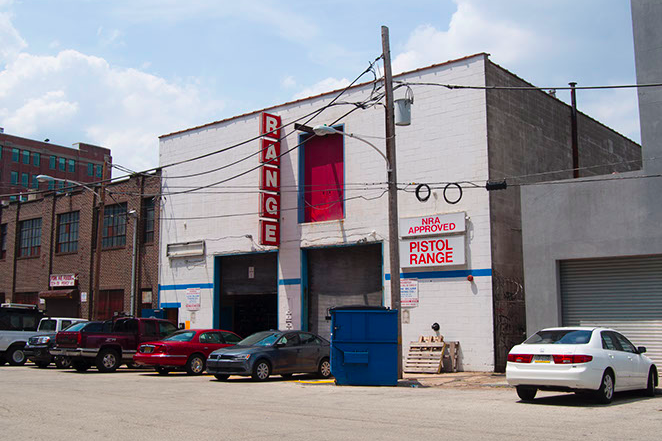 The Gun Range, located at 542 N. Percy Street. A 21-year-old man died Tuesday night after he accidentally shot himself at a gun range in the Spring Garden section of Philadelphia, according to police. The victim, who has not been identified, was at The Gun Range located on the 500 block of North Percy Street when the incident occurred. Authorities say the victim shot himself once in the chest at approximately 7:14 p.m. He was taken to Hahnemann University Hospital and later pronounced dead at 7:38 p.m.
A preliminary investigation revealed that when the gun discharged, the victim had been handling it as if it had been jammed. Police have not identified the victim or the type of firearm he was using at the time. The Gun Range, formerly Colosimo's, is billed as a pistol range but also permits certain rifles and shotguns to be used at its 13 shooting lanes. Patrons must be at least 21 years old to shoot a handgun. Police said an investigation by the Central Detective Division is active and ongoing.